About this time last year I took part in Simple Homeschool‘s A Day in the Life series for the first time It is always interesting to chart a full day of activity at home. We like to run our days pretty naturally, but over time we have gradually imposed a little structure. Nothing rigid. Nothing formal. Just… a more organised flow. So here is what a typical day kinda looks like this year. I hear Prince getting up. He goes downstairs, but I doze for a bit longer. I’m at that blissful stage of being able to sleep even if my kids are awake. Yes – it really does happen. Yeah – it is as good as it sounds. I get up. YAWN. This is my new weekday rising time. I have never been an early riser. It’s not in my genes. Even so, I have found that doing it regularly makes it easier, and the benefits of a longer morning are worth it. I come downstairs to find Prince has been reading a book on the solar system, and he is now drawing a picture of what he has read. I smile to myself; homeschool happening while I sleep? Cha-ching! The kids get breakfast started for themselves. So far, so normal. But I check outside and see that our new electric car, which has been charging in the garden overnight, has got stuck in the mud. Literally. The next hour I forget our Morning High Five ritual and spend it trying to help my husband and brother free the car. Unsuccessfully. Luckily we have a back-up. When we finally give up on the car, I come back inside to find the kids playing ‘Cards of Maths’, working their quick addition skills. We invented the name for this game from Life of Fred. So far today they’ve covered science and maths, and we’re not even dressed. Did I mention I love homeschooling? Hubby arrives back from dropping my brother at his course. He’s not feeling well (particularly after spending an hour in the cold mud), so spends the day in bed. Meanwhile, the rest of us are finally dressed, fed and ready to officially start our day. We get wrapped up and head outside for our morning walk. We try to do this everyday, regardless of weather. In reality it probably happens three days out of five. 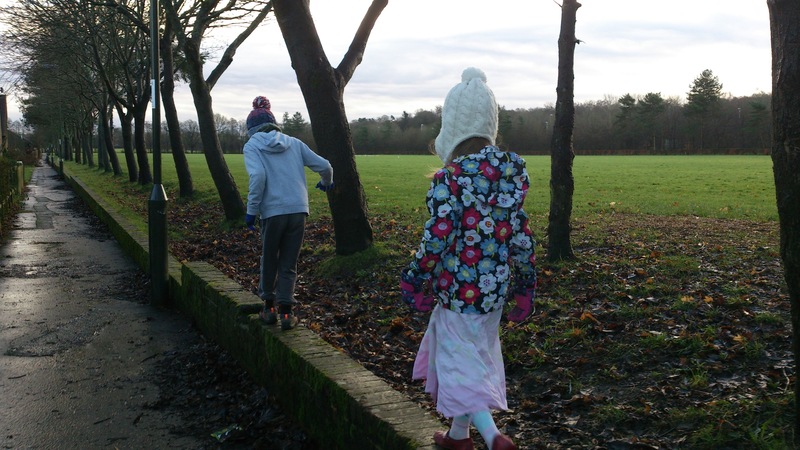 Today we stroll over to our local field, where the kids enjoy walking on walls, investigating puddles and playing pooh sticks. These short bursts of fresh air are always so delicious. We have a rotating schedule of different Bible activities that we do throughout the week. Today I put on a couple of chapters of The Lamb for the kids, while I take the time to read my own Bible. After this we pray together. I guess this is where learning ‘really’ starts. (If you ignore the reading, playing, exploring and discussion which has happened since the moment we got up.) Princess and I snuggle up on the window-seat and read two chapters of her maths book, Life of Fred: Butterflies. We started going through the whole elementary series all together a few months ago, but when we reached half way it started to get a little advanced for Princess. She is only six, after all – still my baby. So while Prince continues to storm his way through, Princess has gone back to redo the earlier books. I like to make sure the foundational understanding – in any topic – is rock solid. While we have fun reading about Fred’s silly adventures, Prince is upstairs doing drum practice. After this, we swap. Prince reads Life of Fred: Honey with me while Princess is whizzing through some mental arithmetic and recorder practice. As Prince moves onto his written math work, I hop on to Duolingo for a bit of French. I enjoy learning, and love that the kids see it as a natural part of everybody’s life – not just something children are forced to do between 9 and 3, Monday to Friday. Princess recently commented that we hadn’t been doing as much free learning time as we used to, and she missed it. I love to have feedback from the kids, and really believe in the value of listening to their opinions. So this morning I call ‘Free Learning Fun’. This means ‘you can do anything you want so long as it’s educational.’ It’s a great way to fuel their natural love of learning. The kids have a quick conversation and decide to play Flags of the World. 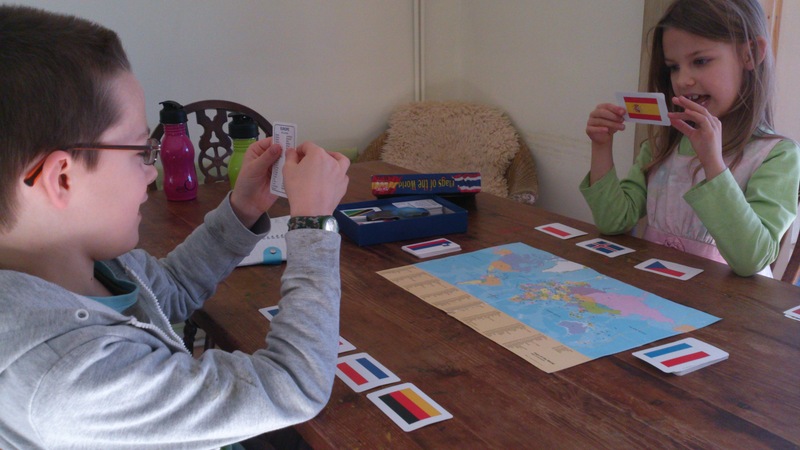 They just use the European cards for now, and focus on learning the flags, countries and capitals of our continent. While they play I sneak in another round of Duolingo, and work on writing a script for my next Advanced Creative Writing Open University assignment. At some point I notice that the sun is shining brightly. As we have solar panals, this is my cue to do any electric-heavy housework, so I quickly pop some washing in the machine and enjoy the thought of a free spin. The kids take a break from playing Flags of the World. I pull out the Kindle, and we all snuggle up under a blanket for a couple of chapters of Black Beauty. Reading together has so many wonderful benefits. It’s a great way to fuel a love of books and teach your child to read; it creates shared experiences; it starts conversations; it expands horizons; it strengthens bonds. Most of our curriculum choices are based on reading aloud together. Lunch time. We don’t always eat this early, but that’s the way it happens today. After eating, the kids carry on their game while I do a bit more script writing. Another snuggle gathering. I love the way so much of our learning takes place under blankets full of love. This time it’s history, and we are nearing the end of Story of the World volume 1, which we thoroughly enjoy (Prince almost always begs for the next chapter when we’re done). We’re in the midst of the Roman period, and today we read about the intense persecution of Christians. After reading we get caught up in a chat about the Ichthys symbol, so we do a bit of research and some drawing on this topic. Officially this is free time. Prince gets stuck into drawing, which is both his highest passion and talent. Princess gets out her plethora of card making supplies and soon the house is covered in paper. It’s messy, but I love it. Especially as they are old enough to tidy it up themselves. They also read, play, and generally amuse themselves productively. 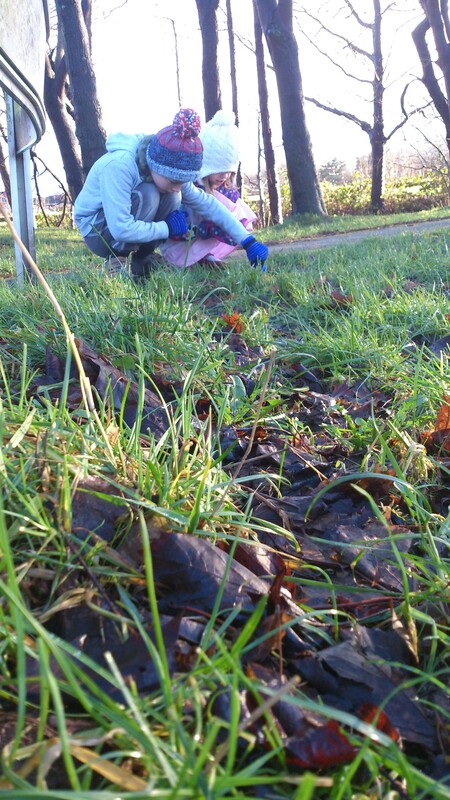 Although not officially a learning time, there is plenty of learning going on if you look carefully. I make use of this time to do things I need or want to do. Today it’s a mix of housework, studying and research. Tidy up time. We always try to tidy up before Daddy, Nana and Uncle Sean get home (yes, we have a full house – just the way we like it! ), so even though Daddy is already here, we still get things sorted. This end of the day sort out also help me to relax after the kids are in bed. Clutter is not my favourite. Tidying up keeps the kids occupied while I get supper sorted (fish salad tonight) and make sure the kitchen is clean. I leave the kids with Daddy while I nip out to pick up my brother. When we get back it’s dinner time. We try to eat early on Tuesday’s as we host house church from 6:30pm. Bed time routine begins. This tends to get dragged out these days. 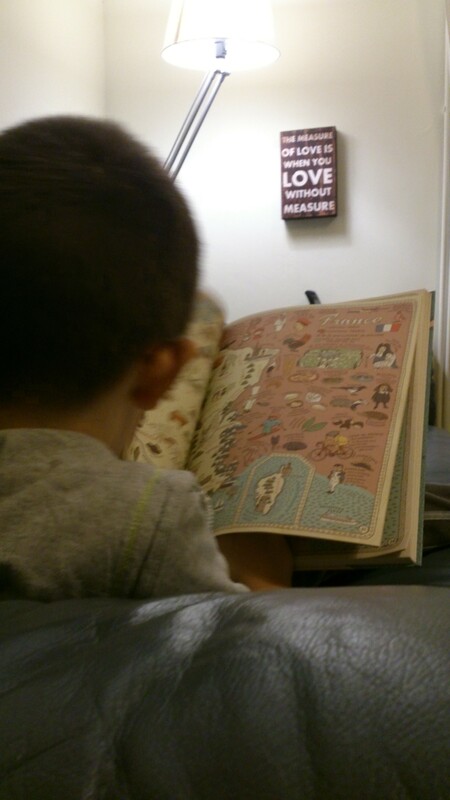 If it finishes quickly, the kids get reading time in bed. Prince is currently working through many books, but mainly the Narnia series. It think he’s on Prince Caspian, but he moves through them so fast I can’t keep up. Princess is into Milly-Molly-Mandy right now. Tonight, however, there is no reading time left, so it’s prayers and lights out. I love to end the day snuggled (again!) with my husband. We usually put something on to watch. I almost always get a foot rub. I know – Best. Husband. Ever. Tonight we watch something on his Ipad in bed, so as not to share germs with the other adults in the house. We watch some documentaries on healthy diets, and fall asleep inspired by ideals we might never achieve, but enjoy striving for. And that’s it! A typical day this year. What will it look like next year, I wonder?